This article is about the channel. For other uses, see CNN (disambiguation). As of August 2010[update], CNN is available in over 100 million U.S. households. Broadcast coverage of the U.S. channel extends to over 890,000 American hotel rooms, as well as carriage on subscription providers throughout Canada. As of July 2015[update], CNN is available to about 96,374,000 pay-television households (82.8% of households with at least one television set) in the United States. Globally, CNN programming airs through CNN International, which can be seen by viewers in over 212 countries and territories. The Cable News Network was launched at 5:00 p.m. Eastern Time on June 1, 1980. After an introduction by Ted Turner, the husband and wife team of David Walker and Lois Hart anchored the channel's first newscast. Burt Reinhardt, the executive vice president of CNN at its launch, hired most of the channel's first 200 employees, including the network's first news anchor, Bernard Shaw. This is Bernie Shaw. Something is happening outside. ... Peter Arnett, join me here. Let's describe to our viewers what we're seeing... The skies over Baghdad have been illuminated. ... We're seeing bright flashes going off all over the sky. Unable to immediately broadcast live pictures from Baghdad, CNN's coverage of the initial hours of the Gulf War had the dramatic feel of a radio broadcast – and was compared to legendary CBS news anchor Edward R. Murrow's gripping live radio reports of the German bombing of London during World War II. Despite the lack of live pictures, CNN's coverage was carried by television stations and networks around the world, resulting in CNN being watched by over a billion viewers worldwide. The Gulf War experience brought CNN some much sought-after legitimacy and made household names of previously obscure reporters. In 2000, media scholar and director of the Center for the Study of Popular Television at Syracuse University, Robert Thompson, stated that having turned 20, CNN was now the "old guard." Shaw, known for his live-from-Bagdhad reporting during the Gulf War, became CNN's chief anchor until his retirement in 2001. Others include then-Pentagon correspondent Wolf Blitzer (now host of The Situation Room) and international correspondent Christiane Amanpour. Amanpour's presence in Iraq was caricatured by actress Nora Dunn as ruthless reporter Adriana Cruz in the 1999 film Three Kings. Time Warner-owned sister network HBO later produced a television movie, Live from Baghdad, about CNN's coverage of the first Gulf War. The presidency of Donald Trump has led to many prominent controversies involving CNN. The network was accused by critics of giving disproportionate amounts of coverage to Donald Trump and Democratic candidate Hillary Clinton. CNN president Jeff Zucker defended CNN against the criticism, commenting that out of the Republican candidates, Trump was the most willing to give on-air interviews. Trump commented upon the allegations during his speech at the 2017 Conservative Political Action Conference (CPAC), jokingly referring to CNN as the "Clinton News Network". In January 2017, CNN reported that Trump had been briefed on a classified dossier which detailed compromising personal and financial information allegedly obtained by the Russian government. While CNN did not publish the dossier, Trump criticized the network during a press conference the following day, and refused to take a question from CNN reporter Jim Acosta, claiming that the network was "fake news". On June 26, 2017, CNN investigative journalists Thomas Frank, Eric Lichtblau, and Lex Haris voluntarily resigned after the network retracted an online article which incorrectly connected Trump aide Anthony Scaramucci to a $10 billion Russian investment fund. The network apologized to Scaramucci and admitted that the online story did not meet their editorial standards. Zucker responded by stressing that the network needs to "play error-free ball" when it comes to any future stories about Trump. In July 2017, Trump posted a video on Twitter of himself tackling Vince McMahon on the ground during WrestleMania 23, edited to replace McMahon's face with the CNN logo. The clip was considered to be a further expression of his opinions regarding the network's quality of coverage. Several media columnists and Democratic politicians condemned the retweeted video, concerned that its substance—given the tone of some of Trump's criticism of mainstream media outlets for what he deems as unfavorable coverage of him and his presidency—could encourage some of his extreme right-wing supporters to commit violence against journalists from outlets outside of the conservative media spectrum. Later that month, a group of Democratic United States Senators, led by Amy Klobuchar, issued a request for information over allegations that the Trump administration was planning to use CNN as "leverage for political gain" in the process of clearing the proposed acquisition of its parent company Time Warner by AT&T—a purchase which was first announced in October 2016. The Daily Caller reported that, in particular, the administration was seeking the removal of Jeff Zucker as CNN president. Although Trump had promised to block the acquisition entirely during his presidential campaign, Trump's transition team later stated that the government planned to evaluate the deal without prejudice. Following the announcement of the acquisition, AT&T CEO Randall L. Stephenson stated that the company was "committed to continuing the editorial independence of CNN". In August 2017, Deadline Hollywood reported that AT&T had considered spinning off CNN and its stake in TMZ post-acquisition. In October 2017, Stephenson downplayed the possibility that the ongoing tensions between Trump and CNN could affect the deal, stating that he "[didn't] know what the relevance of CNN is in terms of an antitrust review", and that AT&T did not plan to make managerial changes to Time Warner properties that were operating well, such as CNN. Later that month, CNN launched a new promotional campaign, "Facts First", in an effort to combat negative perceptions over the quality of its reporting. Using an apple to demonstrate metaphors for fake news and "alternative facts" (in particular, suggesting that one could persistently opine that the apple was actually a banana), the ads publicize a commitment to prioritizing accurate, fact-based reporting before presenting opinions on a particular story. The ad became the subject of parodies, including one by The Daily Caller (which reversed the ad, and amended the slogan with "unless we are reporting on Trump"), and Stephen Colbert (which closed with the line "Now orange you ready to impeach? "), and was criticized by conservative publishers, Republican politicians, and on social media. On November 6, 2017, Stephenson met with Makan Delrahim, assistant Attorney General of the United States Department of Justice Antitrust Division, to discuss antitrust and concentration of media ownership concerns surrounding the acquisition, and possible options for satisfying them. Two days later, major media outlets publicly reported that the Justice Department had recommended that either the entire Turner Broadcasting System unit, or DirecTV, be divested as a condition of the merger. The Financial Times went further, stating that it had specifically demanded the divestment of CNN. Stephenson denied these reports, stating that he never offered to, nor had any intentions to sell CNN. CNN's media analyst Brian Stelter noted that media outlets were interpreting the alleged recommendations as being either a genuine concern for AT&T's scale following the merger, or a retaliatory measure by the Trump administration against CNN. At the DealBook conference in New York City the next day, Stephenson denied that the Department had demanded the divestment of CNN at all (stating that he had "never been told that the price of getting the deal done was selling CNN"), and that the company aimed to "get to a negotiated settlement". However, he stated that if they were unable to do so, AT&T was "prepared to litigate". In a statement to CNBC, a Department of Justice official backed Stephenson, denying that there were any specific demands to divest CNN during the discussion, and considering the claims to be "shocking" and an attempt to politicize the situation. The official added that the Department had officially recommended either abandoning the deal entirely, or divesting DirecTV or Turner, but that it was open to other options for quelling antitrust concerns. The same day, the watchdog group Protect Democracy sued the Department of Justice to seek information on whether the Trump administration had "improperly interfered with the Department's review of the merger between AT&T and Time Warner, or has acted in that matter based on the President's personal dislike of CNN's protected speech." The group had issued a Freedom of Information Act request for these details, but the Department had not responded. On November 20, 2017, the Department of Justice filed an antitrust lawsuit over the acquisition. The proposed merger was affirmed on June 12, 2018, after District of Columbia U.S. District Court Judge Richard J. Leon ruled in favor of AT&T in the lawsuit. The merger closed two days later, with the company becoming a wholly owned subsidiary of AT&T under the renamed parent company WarnerMedia. [non-primary source needed] Under a proposed reorganization announced in March 2019 (which will involve the dissolution of Turner Broadcasting), AT&T stated that CNN would be moved into a new "WarnerMedia News & Sports" division led by Jeff Zucker, adding Turner Sports and the AT&T SportsNet regional sports networks to his oversight. CNN's current weekday schedule consists mostly of rolling news programming during daytime hours, followed by in-depth news and information programs during the evening and primetime hours. The network's morning programming consists of Early Start, an early-morning news program hosted by Christine Romans and Dave Briggs at 4–6 a.m. ET, which is followed by New Day, the network's morning show, hosted by Alisyn Camerota and John Berman at 6–9 a.m. ET. Most of CNN's late-morning and early afternoon programming consists of CNN Newsroom, a rolling news program hosted by Jim Sciutto and Poppy Harlow in the morning and Brooke Baldwin in the afternoon. In between the editions of Newsroom, At This Hour with Kate Bolduan airs at 11 a.m. to noon Eastern, followed by Inside Politics with John King, hosted by John King at noon Eastern, and CNN Right Now with Brianna Keilar at 1 p.m. Eastern. CNN's late afternoon and early evening lineup consists of The Lead with Jake Tapper, hosted by Jake Tapper at 4 p.m. Eastern and The Situation Room with Wolf Blitzer, hosted by Wolf Blitzer at 5–7 p.m. ET. The network's evening and primetime lineup shifts towards more in-depth programming, including Erin Burnett OutFront at 7 p.m. ET, and Anderson Cooper 360° at 8 p.m. ET, followed by Cuomo Prime Time with Chris Cuomo at 9 p.m., and CNN Tonight hosted by Don Lemon at 10 p.m. Eastern. Overnight programming consists of reruns of the primetime lineup, and an overnight simulcast of the CNN International version of CNN Newsroom from Atlanta, GA. Weekend primetime is dedicated mostly to factual programming, such as documentary-style reality series (including Anthony Bourdain: Parts Unknown and United Shades of America), along with original based documentaries and specials (including those presented under blanket titles such as CNN Presents and CNN Special Investigations Unit), as well as acquired documentary films presented under the banner CNN Films. The network's weekend morning programming consists of CNN Newsroom (simulcast from CNN International) at 4–6 a.m. ET, which is followed by the weekend editions of New Day, hosted by Christi Paul and Victor Blackwell, which airs every Saturday at 6–9 a.m. ET and Sunday at 6–8 a.m. ET and the network's Saturday program Smerconish with Michael Smerconish at 9 a.m. Eastern and replay at 6 p.m. Eastern. Sunday morning lineup consists primarily of political talk shows, including Inside Politics with John King, hosted by John King at 8 a.m. Eastern and State of the Union, hosted by Jake Tapper at 9 a.m. Eastern and replay at noon Eastern, and the international affairs program Fareed Zakaria GPS, hosted by Fareed Zakaria at 10 a.m. Eastern and replay at 1 p.m. Eastern, and the media analysis program Reliable Sources, hosted by Brian Stelter at 11 a.m. Eastern. For the 2014–15 season, after cancelling Piers Morgan Tonight (which, itself, replaced the long-running Larry King Live), CNN experimented with running factual and reality-style programming during the 9:00 p.m. ET hour, such as John Walsh's The Hunt, This Is Life with Lisa Ling, and Mike Rowe's Somebody's Gotta Do It. Jeff Zucker explained that this new lineup was intended to shift CNN away from a reliance on pundit-oriented programs, and attract younger demographics to the network. Zucker stated that the 9:00 p.m. hour could be pre-empted during major news events for expanded coverage. These changes coincided with the introduction of a new imaging campaign for the network, featuring the slogan "Go there". In May 2014, CNN premiered The Sixties, a documentary miniseries produced by Tom Hanks and Gary Goetzman which chronicled the United States in the 1960s. Owing to its success, CNN commissioned follow-ups focusing on other decades. Anderson Cooper 360° has since been expanded back into a two-hour format to occupy the 8-9 p.m. timeslot. CNN began broadcasting in the high definition 1080i resolution format in September 2007. This format is now standard for CNN and is available on all major cable and satellite providers. CNN's political coverage in HD was first given mobility by the introduction of the CNN Election Express bus in October 2007. The Election Express vehicle, capable of five simultaneous HD feeds, was used for the channel's CNN-YouTube presidential debates and for presidential candidate interviews. In December 2008, CNN introduced a comprehensive redesign of its on-air appearance, which replaced an existing style that had been used since 2004. On-air graphics took a rounded, flat look in a predominantly black, white, and red color scheme, and the introduction of a new box next to the CNN logo for displaying show logos and segment-specific graphics, rather than as a large banner above the lower-third. The redesign also replaced the scrolling ticker with a static "flipper", which could either display a feed of news headlines (both manually inserted and taken from the RSS feeds of CNN.com), or "topical" details related to a story. 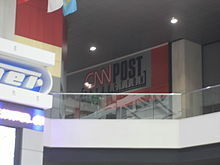 CNN's next major redesign was introduced on January 10, 2011, replacing the dark, flat appearance of the 2008 look with a glossier, blue and white color scheme, and moving the secondary logo box to the opposite end of the screen. Additionally, the network began to solely produce its programming in the 16:9 aspect ratio, with standard definition feeds using a letterboxed version of the HD feed. On February 18, 2013, the "flipper" was dropped and reverted to a scrolling ticker; originally displayed as a blue background with white text, the ticker was reconfigured a day later with blue text on a white background to match the look of the 'flipper'. On July 27, 2012, CNN president Jim Walton announced he was resigning after 30 years at the network. Walton remained with CNN until the end of that year. In January 2013, former NBCUniversal President Jeff Zucker replaced Walton. CNN launched its website, CNN.com (initially known as CNN Interactive), on August 30, 1995. The site attracted growing interest over its first decade and is now one of the most popular news websites in the world. The widespread growth of blogs, social media and user-generated content have influenced the site, and blogs in particular have focused CNN's previously scattershot online offerings, most noticeably in the development and launch of CNN Pipeline in late 2005. On April 18, 2008, CNN.com was targeted by Chinese hackers in retaliation for the channel's coverage on the 2008 Tibetan unrest. CNN reported that they took preventative measures after news broke of the impending attack. On October 24, 2009, CNN launched a new version of the CNN.com website; the revamped site included the addition of a new "sign up" option, in which users can create their own username and profile, and a new "CNN Pulse" (beta) feature, along with a new red color theme. However, most of the news stories archived on the website were deleted. As of 2016[update], there are four versions of the website: the American version, the International version, the Spanish version, and the Arabic version. Readers can choose their preferred version, but, in the absence of a selection, the server determines an edition according to the requesting IP address. On March 7, 2017, CNN announced the official launch of its virtual reality unit named CNNVR. It will produce 360 videos to its Android and iOS apps within CNN Digital. It is planning to cover major news events with the online, and digital news team in New York City, Atlanta, London, Hong Kong, San Francisco, Dubai, Johannesburg, Tokyo, and Beijing. 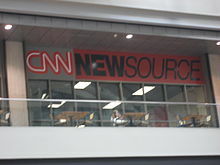 CNN Newsource offices at the CNN Center in Atlanta. CNN Newsource is a subscription-based affiliation video service that provides CNN content to television station affiliates with CNN, including terrestrial stations and international stations. Newsource allows affiliates to download video from CNN, as well as from other affiliates who upload their video to Newsource. In October 2012, CNN formed a film division called CNN Films to distribute and produce made-for-TV and feature documentaries. Its first acquisition was a documentary entitled Girl Rising, a documentary narrated by Meryl Streep that focused on the struggles of girls' education. CNN en Español televised debate for the 2005 Chilean elections. Post production editing offices in Atlanta. CNN-News18 – an Indian news channel. CNN launched two specialty news channels for the American market which would later close amid competitive pressure: the sports news channel CNNSI shut down in 2002, while business news channel CNNfn shut down after nine years on the air in December 2004. CNN had a partnership with Sports Illustrated through the sports website CNNSI.com, but sold the domain name in May 2015. CNNfn's former website used to redirect to money.cnn.com, a product of CNN's strategic partnership with Money magazine. Money and Sports Illustrated were both Time Warner properties until 2014, when the company's magazine division was spun off into the separate Time Inc.
CNN operates bureaus in the following cities as of February 2017[update]. Boldface indicates that the city is home to one of CNN's original bureaus, meaning it has been in operation since the network's founding. The CNN programming studied tended to cast a negative light on Republican candidates – by a margin of three-to-one. Four-in-ten stories (41%) were clearly negative while just 14% were positive and 46% were neutral. The network provided negative coverage of all three main candidates with McCain faring the worst (63% negative) and Romney faring a little better than the others only because a majority of his coverage was neutral. It's not that Democrats, other than Obama, fared well on CNN either. Nearly half of the Illinois Senator's stories were positive (46%), vs. just 8% that were negative. But both Clinton and Edwards ended up with more negative than positive coverage overall. So while coverage for Democrats overall was a bit more positive than negative, that was almost all due to extremely favorable coverage for Obama. In October 2016, WikiLeaks published emails from John Podesta which showed CNN contributor Donna Brazile passing the questions for a CNN-sponsored debate to the Clinton campaign. In the email, Brazile discussed her concern of Clinton's ability to field a question regarding the death penalty. The following day Clinton would receive the question about the death penalty, verbatim from an audience member at the CNN-hosted Town Hall event. According to a CNNMoney investigation, the debate moderator Roland Martin of TV One "did not deny sharing information with Brazile." CNN severed ties with Brazile three days later, on October 14, 2016. 2018: CNN won a network-record six news & documentary Emmy Awards. They are, Outstanding Breaking News Coverage, Outstanding Continuing Coverage of a News Story in a Newscast, Outstanding Live Interview, Outstanding Hard News Feature Story in a Newscast, Outstanding News Special, Outstanding Science, Medical and Environmental Report. 2018: CNN's Nima Elbagir to receive 2018 Courage in Journalism Award from the International Women's Media Foundation. 2018: CNN received the George Polk Award for Foreign Television Reporting for uncovering a hidden modern-day slave auction of African refugees in Libya. Reporting done by Nima Elbagir and Raja Razek. 2017: CNN received the Prince Rainier III Special Prize at Monte Carlo TV Festival for the documentary, Midway: A Plastic Island about sea pollution. ^ "Charles Bierbauer, CNN senior Washington correspondent, discusses his 19-year career at CNN. (May 8, 2000)". Cnn.com. Retrieved October 12, 2013. ^ "CNN changed news – for better and worse". Taipei Times. May 31, 2005. Retrieved January 24, 2009. ^ Kiesewetter, John (May 28, 2000). "In 20 years, CNN has changed the way we view the news". Cincinnati Enquirer. Retrieved January 24, 2009. ^ "CNN Show Pages". www.cnn.com. Retrieved August 30, 2016. ^ a b "This date in deal history: CNN begins broadcasting". Deal Magazine. May 31, 2006. Archived from the original on June 24, 2009. Retrieved June 26, 2006. ^ Staff (July 21, 2015). "List of how many homes each cable network is in as of July 2015". TV by the Numbers. Retrieved August 9, 2017. ^ "CNN is Viewers Cable Network of Choice for Democratic and Republican National Convention Coverage". Time Warner. August 18, 2000. Retrieved February 20, 2010. ^ Barkin, Steve Michael; Sharpe, M.E. (2003). American Television News: The Media Marketplace and the Public Interest. ^ Wiseman, Lauren (May 10, 2011). "Burt Reinhardt dies at 91: Newsman helped launch CNN". The Washington Post. Retrieved May 19, 2011. ^ "Cable News: Fact Sheet". Pew Research Center's Journalism Project. June 15, 2016. Retrieved April 20, 2017. ^ "CNN Newsource". CNN Newsource. Retrieved April 20, 2017. ^ Sterling, Christopher H. (September 25, 2009). Encyclopedia of journalism. 6. Appendices. SAGE. ISBN 9780761929574. ^ Tyree, Omar (April 27, 2009). The Equation: Applying the 4 Indisputable Components of Business Success. John Wiley & Sons. ISBN 9780470452837. ^ "Ted Turner, the Lost Tycoon". The New Yorker. Retrieved April 20, 2017. ^ Leon, Charles L. Ponce de (May 4, 2015). That's the Way It Is: A History of Television News in America. University of Chicago Press. ISBN 9780226472454. ^ Alvarado, Manuel; Buonanno, Milly; Gray, Herman; Miller, Toby (December 9, 2014). The SAGE Handbook of Television Studies. SAGE. ISBN 9781473911086. ^ "The Gulf War and its Consequences". Yale.edu. 1996. Retrieved October 12, 2013. ^ "'Baghdad': When CNN was the news". Los Angeles Times. December 6, 2002. ISSN 0458-3035. Retrieved April 22, 2017. ^ Rohwer, Jim (March 15, 2001). Remade in America: How Asia Will Change Because America Boomed. Crown Publishing Group. ISBN 9780609504123. ^ "After 20 years on air, this is CNN News network celebrates anniversary with specials". NewsOK.com. June 1, 2000. Retrieved April 22, 2017. ^ "Bernard Shaw". Biography.com. Retrieved April 22, 2017. ^ "Where Are They Now? Bernard Shaw". The Washington Times. Retrieved April 22, 2017. ^ Gilboa, Eytan (2005). "The CNN Effect: The Search for a Communication Theory of International Relations" (PDF). Political Communication: 28. ^ "No-nonsense news returns to CNN". PressDemocrat.com. Retrieved February 20, 2010. ^ NewsActive3 (August 5, 2017). "CNN Headline News: September 11, 2001" – via YouTube. ^ "CNN.com". Web.archive.org. September 11, 2001. Archived from the original on September 11, 2001. Retrieved October 12, 2013. ^ "CNN BREAKING NEWS Transcript – Terrorist Attack on United States". Transcripts.cnn.com. September 11, 2001. Retrieved October 12, 2013. ^ "CNN Wins Two RTNDA 2002 Edward R. Murrow Awards". Time Warner. June 20, 2002. Retrieved April 25, 2016. ^ "CNN/WMUR-TV/New Hampshire Union Leader Democratic Debate". Gwu.edu. June 3, 2007. Retrieved February 20, 2010. ^ Baker, Peter. "YouTube and CNN invite ordinary Americans into presidential debates". International Herald Tribune. Retrieved October 12, 2013. ^ a b "Super Tuesday gets presidential treatment". Latimes.com. February 4, 2008. Retrieved October 12, 2013. ^ Katz, A.J. (December 28, 2016). "2016 Ratings: CNN Has Most-Watched Year Ever". Adweek. ^ Grynbaum, Michael (December 1, 2016). "CNN's Coverage of Trump Was Biased, Presidential Candidates' Aides Say". The New York Times. ^ Georgantopoulos, Mary (October 14, 2016). "CNN's President Says It Was A Mistake To Air So Many Trump Rallies And "Let Them Run"". BuzzFeed. ^ Wolcott, James (February 2017). "How Trump Trumped The New York Times, CNN, and the Rest of the Media in 2016". Vanity Fair. ^ Sorkin, Amy Davidson (February 24, 2017). "Trump Talks About Enemies, Again, at CPAC". The New Yorker. ISSN 0028-792X. Retrieved October 27, 2017. ^ "Here's why CNN Became a Lightning Rod for Accusations of Media Bias". Fortune. December 3, 2016. Retrieved April 21, 2017. ^ "Trump calls CNN 'fake news', as channel defends its reporting on intelligence briefing". Politico. Retrieved October 27, 2017. ^ Farhi, Paul (June 27, 2017). "CNN's Russia story debacle came at the worst possible time for the network". The Washington Post. Retrieved September 13, 2017. ^ "How CNN found the Reddit user behind the Trump wrestling GIF". CNN Politics. July 4, 2017. Retrieved July 5, 2017. ^ Grynbaum, Michael M. (July 2, 2017). "Trump Tweets a Video of Him Wrestling 'CNN' to the Ground". The New York Times. ISSN 0362-4331. Retrieved October 28, 2017. ^ Gryta, Thomas; Hagey, Keach; Cimmiluca, Dana (October 22, 2016). "AT&T Reaches Deal to Buy Time Warner for $86 Billion". The Wall Street Journal. Retrieved October 22, 2016. ^ Johnson, Ted (July 11, 2017). "Senators Press Trump on White House Contacts Over AT&T-Time Warner Merger". Variety. Retrieved October 27, 2017. ^ "White House could use AT&T/Time Warner deal as 'leverage' against CNN". Ars Technica. Retrieved October 27, 2017. ^ a b Lieberman, Anita Busch, David (August 4, 2017). "AT&T Mulling Sell-Off Of Major Assets Under Turner After Time Warner Merger". Deadline. Retrieved October 27, 2017. ^ N'Duka, Anthony D'Alessandro, Amanda (October 4, 2017). "AT&T Chief Randall Stephenson Plans To Keep Time Warner Management Intact Post Merger, Says "I'm Not A Media Tycoon"". Deadline. Retrieved October 27, 2017. ^ Steinberg, Brian (October 23, 2017). "CNN Fights 'Fake News' Claims With New 'Facts First' Campaign (EXCLUSIVE)". Variety. Retrieved November 14, 2017. ^ "CNN Launches New Ad Campaign, 'Facts First'". The Hollywood Reporter. Retrieved November 14, 2017. ^ Meghann Farnsworth (October 24, 2017). "Watch BuzzFeed News and The Daily Caller troll CNN's 'This is an apple' ad". Recode. ^ Ed Mazza (October 24, 2017). "CNN's New #FactsFirst 'Apple' Ad Sparks Battle Over Banana Truthers". HuffPost. ^ Brooke Singman (October 23, 2017). "GOP rep counters CNN's 'Facts First' ad with pro-life video: 'This is a baby'". Fox News. ^ Eddie Scarry (October 23, 2017). "CNN mocked for new 'BANANA' ad". ^ a b c d Stelter, Brian. "AT&T CEO Randall Stephenson: Ready to go to court to get Time Warner deal done". CNNMoney. Retrieved November 10, 2017. ^ a b "Government never tried to force CNN sale in AT&T-Time Warner deal, official says". CNBC. Retrieved November 10, 2017. ^ Merced, Michael J. de la; Steel, Emily; Sorkin, Andrew Ross (November 8, 2017). "U.S. Said to Seek Sale of CNN or DirecTV in AT&T-Time Warner Deal". The New York Times. ISSN 0362-4331. Retrieved November 8, 2017. ^ "U.S. demands CNN sale to approve AT&T/Time Warner deal: Financial Times". Reuters. November 8, 2017. Retrieved November 8, 2017. ^ "Is the AT&T merger with Time Warner being threatened because of a beef with CNN?". The Verge. Retrieved November 8, 2017. ^ "Watchdog lawsuit seeks to determine if White House influenced Time Warner-AT&T merger". USA Today. Retrieved November 10, 2017. ^ "AT&T Sued by U.S. Seeking to Block Merger With Time Warner". Bloomberg.com. November 20, 2017. Retrieved November 20, 2017. ^ Hadas Gold (June 12, 2018). "Judge approves $85 billion AT&T-Time Warner deal". CNNMoney. Time Warner. Retrieved September 21, 2018. ^ Cecilia Kang; Michael J. de la Merced (November 20, 2017). "Justice Department Sues to Block AT&T-Time WarnerMerger". The New York Times. The New York Times Company. Retrieved September 21, 2018. ^ "AT&T Completes Acquisition of Time Warner Inc". AT&T (Press release). June 15, 2018. Retrieved September 21, 2018. ^ "Why a Sugar High is in the Making for Kate Bolduan's Daughter". TVNewser. Adweek Blog Network. Retrieved August 20, 2015. ^ Hall, Colby. "CNN Reveals New 7 pm Show Title: Erin Burnett: OutFront". Mediaite. Retrieved September 23, 2011. ^ "CNN Keeps Burnett, Cooper in Primetime While Adding 'CNN Tonight' at 10 P.M." Variety. Retrieved April 11, 2014. ^ Flint, Joe (April 10, 2014). "CNN unveils new prime-time lineup, moves away from 9 p.m. talk". Los Angeles Times. Retrieved April 11, 2014. ^ "CNN Doubles Down on a Mix of Live News, Original Series and Films". TVNewer. Retrieved April 11, 2014. ^ Moraes, Lisa de (May 17, 2017). "CNN Adds Series On 1960s & '70s To Slate; HLN Adds 'Unmasking A Killer'". Deadline. Retrieved May 13, 2018. ^ Petski, Denise (April 11, 2018). "CNN Adds Six New Original Series To 2019 Slate; Projects From Sanjay Gupta, Vox Media, More". Deadline. Retrieved May 13, 2018. ^ "CNN To Follow 'The Sixties' Docu-series With 'The Seventies'". Variety. Retrieved April 3, 2016. ^ "CNN To Launch 'The Eighties' In March". Variety. Retrieved April 3, 2016. ^ "Ratings for Anderson Cooper's Karen McDougal Interview". TVNewser. Retrieved May 28, 2018. ^ Robbins, Stephanie. "TV Week September 6, 2007 CNN HD Debuts". Tvweek.com. Archived from the original on October 15, 2013. Retrieved October 12, 2013. ^ "CNN Rolls Out Election Express". Tvtechnology.com. October 17, 2007. Archived from the original on November 25, 2011. Retrieved October 12, 2013. ^ Dickson, Glen (December 15, 2008). "CNN Gets New Graphic Look". Broadcasting & Cable. Retrieved January 24, 2009. ^ a b "CNN Debuts New Graphics Package". TVNewser. Archived from the original on July 13, 2014. Retrieved September 3, 2014. ^ Airens, Chris (February 18, 2013). "The Ticker Returns to CNN". TVNewser. Retrieved February 19, 2013. ^ "CNN Updates Graphics Package". TVNewser. Retrieved September 3, 2014. ^ "CNN customizes new company-wide font". PromaxBDA. Retrieved September 22, 2016. ^ "CNN is launching a drone-based news collecting operation". TechCrunch. August 18, 2016. Retrieved January 19, 2018. ^ "AP NewsBreak: CNN chief Jim Walton calls it quits". The Wall St. Journal. July 27, 2012. Retrieved July 27, 2012. ^ Shapiro, Rebecca (November 29, 2012). "Jeff Zucker CNN President: Network Officially Hires Former NBC Universal Chief". Huffington Post. Retrieved November 28, 2012. ^ "CNN drops Carville, Matalin, Erickson and executive VP Mark Whitaker". The Daily Caller. Retrieved January 29, 2013. ^ "CNN Interactive Timeline: May - December, 1995". www.cnn.com. Retrieved September 26, 2018. ^ Johnson, Peter (March 20, 2005). "It's prime time for blogs on CNN's 'Inside Politics'". USA Today. Retrieved January 24, 2009. ^ "CNN Revives 'Inside Politics'". Thomson/Reuters. Retrieved January 31, 2014. ^ Cobb, Chris (April 12, 2008). "'Citizen journalist' often there first to snap photos". Regina Leader-Post. Archived from the original on June 21, 2008. Retrieved January 24, 2009. ^ "CNN live streaming website". ^ "CNN website targeted". cnn.com. April 18, 2008. Retrieved October 12, 2013. ^ Claburn, Thomas, "CNN Faces Cyberattack Over Tibet Coverage", InformationWeek, 2008. ^ "CNN Awarded Technical Emmy". Archived from the original on July 21, 2011. ^ "CNN crew released". CNN. April 12, 2001. Archived from the original on March 12, 2008. Retrieved November 14, 2017. ^ "Videophone Technology". Privateline.com. October 9, 2001. Archived from the original on October 15, 2013. Retrieved March 10, 2016. ^ "Welcome to the New CNN.com – Interactive tour". CNN. Retrieved February 20, 2010. ^ Lee, Nicole (May 7, 2014). "TuneIn tries reinventing itself as a social network for audio". Engadget.com. Retrieved February 5, 2015. ^ Brion, Raphael (April 13, 2010). "Eatocracy: CNN Gets in the Food Blog Business". Eater.com. ^ "How to join the chat and view the Webcast". cnn.com. Retrieved October 12, 2013. ^ "Expert Q&A". thechart.blogs.cnn.com. Retrieved April 10, 2016. ^ Janko Roettgers (March 7, 2017). "CNN Adds 360 Video to Mobile Apps, Website as Part of VR Push". Variety. Retrieved March 8, 2017. ^ engadget (March 7, 2017). "CNN launches a virtual reality news unit". TechCrunch. Retrieved March 8, 2017. ^ "CNN Digital Debuts its Virtual Reality Unit: CNNVR". CNN Pressroom. Retrieved March 8, 2017. ^ Perlberg, Steven (November 28, 2016). "CNN Buys Casey Neistat's Video App Beme". Wall Street Journal. ISSN 0099-9660. Retrieved December 4, 2016. ^ Hackett, Matt (November 28, 2016). "Beme is Shutting Down, But Our Work Is Just Starting". Medium. Retrieved December 4, 2016. ^ "i sold my company to CNN". November 30, 2016. Retrieved February 3, 2017. ^ "CNN update". Youtube. Casey Neistat. July 5, 2017. Retrieved July 9, 2017. ^ "Beme News". YouTube. Retrieved December 12, 2017. ^ "CNN Creates Unit To Acquire Documentary Films For Theaters And TV." CNN press release via Deadline Hollywood (October 8, 2012). ^ "Cumulus taps CNN for Westwood One news service". Atlanta Business Chronicle. Retrieved December 12, 2014. ^ "CNN.com". Edition.cnn.com. Retrieved October 12, 2013. ^ "Nasce 'Cnn Italia' 24 ore di notizie web". la Repubblica (in Italian). September 15, 1999. Retrieved April 22, 2009. ^ "Roma-Atlanta via web Parte CNN Italia". la Repubblica (in Italian). September 15, 1999. Retrieved April 22, 2009. ^ Silver, Elliot. "CNNSi.com Sells for $5,500". DomainInvesting.com. DomainInvesting.com. Retrieved April 4, 2016. ^ "CNN Worldwide Fact Sheet – CNN Press Room – CNN.com Blogs:". CNN Press Room. Retrieved April 14, 2017. ^ "The Early Campaign" (PDF). Retrieved February 20, 2010. ^ "USATODAY.com – New CNN chairman meets with GOP critics". Usatoday30.usatoday.com. August 6, 2001. Retrieved February 5, 2015. ^ a b Stelter, Brian (October 12, 2016). "Wikileaks mystery: How did town hall question get to Clinton campaign?". CNN. Retrieved October 22, 2016. ^ "CNN Wins Network-Record Six News & Documentary Emmy® Awards". Retrieved October 2, 2018. ^ "CNN's Nima Elbagir to Receive 2018 Courage in Journalism Award". Retrieved October 2, 2018. ^ "George Polk Award for Foreign Television Reporting". Retrieved February 21, 2018. ^ "David Begnaud, Ronan Farrow, Elle Reeve, Nima Elbagir, Raja Razek Among 2017 Polk Award Winners". Adweek's TVNewser. Retrieved February 20, 2018. ^ "Overseas Press Club of America Announces Annual Award Winners". Overseas Press Club of America. Retrieved March 21, 2018. ^ "CNN Wins Prince Rainier III Special Prize at Monte Carlo TV Festival". CNN.com. Retrieved June 22, 2017. ^ "British TV Rules Monte Carlo TV Fest, With Double Wins for 'Victoria,' 'Fleabag'". Variety.com. Retrieved June 20, 2017. ^ "Four Freedom Awards". Archived from the original on March 25, 2015. Retrieved April 4, 2015. Wikimedia Commons has media related to CNN. This page was last edited on 2 April 2019, at 13:25 (UTC).